New Theatre Royals resident costume designer Naomi Gibbs working with The Beast at the press launch for the NTR's 2017 Christmas show, Beauty and The Beast. There are plenty in the music business who think they might be Peter Pan. But New Theatre Royal is bringing a real slice of Neverland to The Kids’ Arena at Victorious Festival this weekend. Following the success of Beauty and The Beast last Christmas, this year the city centre theatre is putting on Peter Pan, which is set to be its biggest production to date. JM Barrie’s much-loved book will be transformed into a spectacular family show with a stunning cast, beautiful array of sets, costumes and effects. With activities for all ages, visitors will have the opportunity to learn more about JM Barrie’s wonderful world, from the rooftops of Edwardian England to the depths of the mermaids’ lagoon. In addition to the face painting and arts and crafts, NTR’s resident costume designer Naomi Gibbs will be showcasing her visionary costume designs and seamstress skills. Visitors will also get a sneak preview of the spectacular costumes and magical set designs for the theatre’s upcoming production, which has again been written and directed by Scott Ramsay, the NTR’s chief executive. Scott says: ‘It’s wonderful to be returning to the Children’s arena at Victorious Festival again this summer. ‘This exciting new experience will give our local audiences a great insight in to not only costume designing - a wonderful aspect of our theatre - but also a taster for what we have planned with Peter Pan this winter. ‘We’re in the midst of creating it at the moment - building the sets, making the costumes, finalising the script, and it’s all been cast, so it’s moving forward really nicely, and everyone feels very positive about it. ‘Peter Pan isn’t a title that’s not been seen very much around here. And I’m sort of a JM Barrie fan anyway, I come from the same part of Scotland, and I’ve done a lot of his plays over the years. 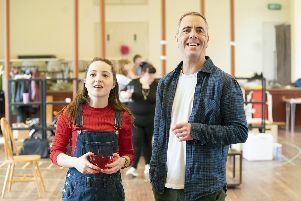 ‘But we’re really excited for Peter Pan and we wanted to take a slice of Neverland to Victorious this year – it’s really important for us to go there. ‘Victorious still has a very strong community sense to it, even though it is now a big music festival. You compare it to other big festivals and it still feels very grounded in the Portsmouth community, and it’s good for us to be part of that. ‘We wanted that connection between what we’re doing at Victorious and something that we’re doing at the theatre so that we can inspire people to come to the theatre. Describing what they’ll be doing at the festival, Scott says: ‘It’s a little bit of Neverland in the context of what you can do in a tent on Southsea Common – we’ll have a couple of characters there, we’ll have sets up where people can take their pictures, face-painting, lots of activities for kids to make things and take away with them, and there will be costuming going on so people can actually see them being made. ‘You can see Naomi showing the designs and how she comes up with them, and then see her sewing machine actually making them. And there’s even a connection to one of Portsmouth’s most famous literary sons. ‘We’ve done a little bit of stuff with the Conan Doyle collection as well because there’s a link there, they were friends and played on the same cricket team together, so we tap into that as well. All of the entertainment in the Kids’ Arena is included in the festival ticket price. Peter Pan is at the NTR from December 13-31. Go to newtheatreroyal.com.